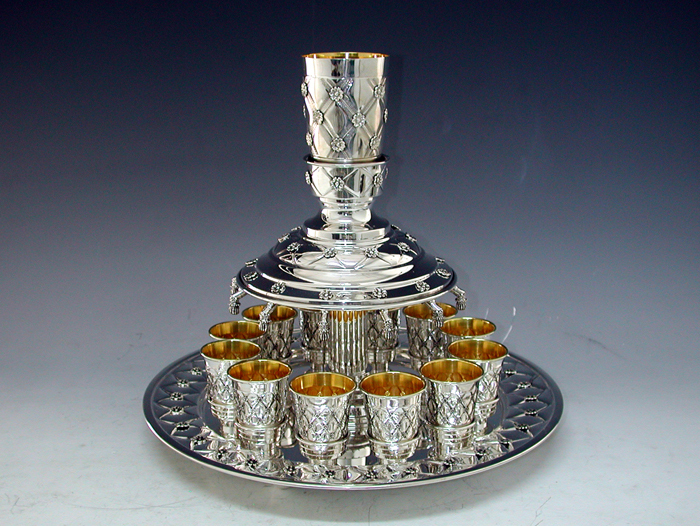 Hadad Silversmiths created this 925 Sterling Silver Wine Fountain that has one full size Kiddush Cup and 12 Liquor size kiddush Cups.Made in Israel by Jewish Laborers.Total Silver Wt 1700g. One full size Kiddush cup sits atop a wine fountain that pours into a matching set of 12 liquor size cups which sit spaced around a round plate. The entire fountain, its base plate, the main cup and all the smaller cups are made from Sterling Silver engraved in Floral Diamond style for an truely elegant way to quickly serve the Kiddush wine to all the family and guests at your table. Height of Central Kiddush cup: 10 cm [approx 3.9 inch] and it holds a full Shiur [halachic amount] required for Kiddush.